It’s hard to believe, but it’s December again! Time for our 8th edition of Worldwide Christmas Scrapbooking Freebies (WWCSF). As I’m really into Pocket Letters these days, I wanted to create something that could be used for both scrapbooking and PLs and I came up with 30 different journal/pocket-letter cards. They are 2.5×3.5″, 300 dpi and if you print them on cardstock, you’re ready to go! You can download it here (28.3 MB). 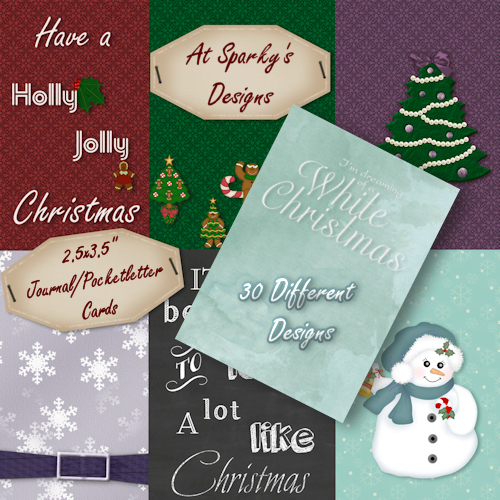 To see the complete list, please go to the Worldwide Christmas Scrapbooking Freebies Blog, where you’ll find links to lots of goodies, created for you by designers from all over the world! Wishing you all a wonderful Holiday Season, a peaceful Christmas and I hope you enjoy the freebie! This looks lovely, but can you please explain how one can download it? There are so many different download buttons and so far none of them have gone to your file. Thanks, Edna B. JOURNAL CARDS WOO!!!! Thank you! I love these JCs — they are so festive & pretty! thank you for sharing them! Thank you sooooooooo much. They are just lovely!